Photograph of Dennis Brown (as a baby) with two adult members of the Brown family picnicking together. Photograph of three-year-old Dennis Brown playing with a pail in his backyard. This portion of the recording pertains to Dennis Brown's memories of the time when he was taking correspondence and university courses while finishing the house off. He tells the story of the purchasing a car on a whim. 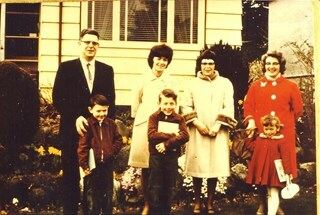 Dennis Brown (far left) with his wife Cice (Chandler) Brown (far right) and their five children, . Item no. 549-018. Recording is an interview with Dennis Brown conducted by Burnaby Village Museum employee Eric Damer, September 18, 2012. Major theme discussed: life in Burnaby during the war years. Dennis Brown’s family moved from North Vancouver to South Burnaby, near Central Park, in 1941. Dennis finished his high school in Burnaby and enlisted in the air force, completing basic training. He returned to Burnaby looking for work and found employment stoking the boiler of a cargo ship. He and a friend spent the next year sailing around the world. When Dennis returned to Burnaby, he found work at a local shingle mill, married Cice Chandler and began work on a new home at Willingdon and Imperial. He and Cice had two children in 1948 and 1950, and three more in the later nineteen-fifties. By this time, Dennis had retrained as an accountant and worked in several large businesses in Vancouver. In their later years, both Dennis and Cice were active in the restoration of the Parker Carousel and Interurban 1223 (now on display at the Burnaby Village Museum) and both were honoured independently with “Citizen of the Year” awards. Cice (Chandler) Brown was, additionally, Honourary Reeve of the Burnaby Village Museum. This portion of the recording pertains to Dennis Brown's memories of recreational activities he and his wife Cice (Chandler) Brown and their children participated in. He discusses the changes that he's seen in Burnaby, mainly as density increases. This portion of the recording pertains to Dennis Brown's days in the merchant marines as well as his first memories of meeting his wife Cice (Chandler) Brown. This portion of the recording pertains to Dennis Brown's memories of reconnecting with his wife Cice (Chandler) Brown on the interurban tram. He discusses his job history and tells the story of single-handedly clearing land for their family home. Dennis Brown, wearing sash number 6, rides carousel horse Scampering Dawn. Taken at the Carousel 100th Anniversary event held on May 5, 2012 at the Burnaby Village Museum. This portion of the recording pertains to Dennis Brown's early life in Burnaby as a teenager, attending Burnaby South High School as well as completing basic training for the air force in 1944. Photograph of the graduating class of 1943 at Burnaby South High School sitting and standing in three rows next to the school. Dennis Brown (who later married Cice Chandler) is standing second from the left in the middle row, Cice Chandler (later Brown) is standing third from the left and Cice's best friend, Shirley Wray, is standing fifth from the left. Betty Warburton sitting seventh from the left in the front row. Note in black ink on verso of photograph reads: "Graduating class of 1943 from Hugh M. Fraser (Burnaby South) to go with the diary of Shirley Wray"